This research examines pre 2005 restaurant valuation literature in an effort to identify unexplored areas in this emerging field. Although much has been written regarding valuation in general, there has been very little appraisal literature focusing specifically on restaurants. Of the research that has been conducted, there has been some controversy about whether the appropriate value of a restaurant is a market value or a going concern value. We also explore the continuing usage of “rules of thumb” in restaurant valuation. Although these rules are often based in theory as well as practice, their breadth can severely limit their usefulness. 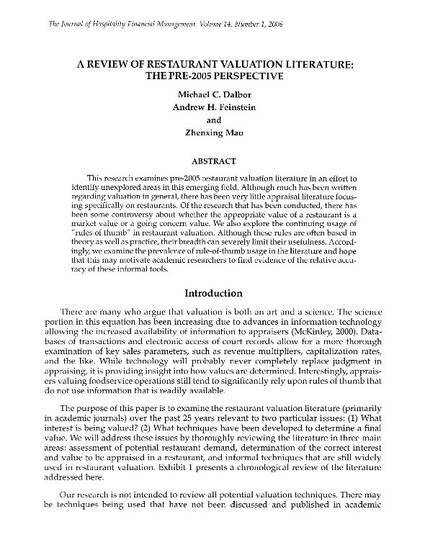 Accordingly, we examine the prevalence of rule-of-thumb usage in the literature and hope that this may motivate academic researchers to find evidence of the relative accuracy of these informal tools. Copyright © 2006 University of Massachusetts Amherst.